The Grampstr's Pride is at the Suncoast Boat Show at Marina Jacks in Sarasota, Florida in partnership with Endeavour Catamaran Corporation. There are three trawlercats on display: Our 48foot, a 44foot and a 36foot. If you are in the area, come on down and visit us Saturday or Sunday!! The weather is perfect to come and see all the boats at the Miami International Boat Show. Endeavour Cataraman Corporation Is represented by the 48 foot Grampstr's Pride. We are located at 5000 Collins Avenue ramp #4. Cruising along the ICW (intracoastal waterway) from Venice to Fort Myers at a faster clip makes one realize that this portion of the journey is best enjoyed at a slow pace. The mid Gulf Coast has so much to offer that two weeks just bobbing along is a much more gentle way to stop and poke and enjoy all the quaint gulf towns and yacht clubs and get the full benefit of soaking up all the positive energy along this coast. Having a individualized custom charter experience allows one to set the pace. Doing a transition charter, however, requires staying on course and sticking to a schedule. A transition experience is for learning new skills such as navigating the locks and getting the pace and timing of bridges. Often the captain must make decisions of going open water or protected waterways. There are many factors to consider in making these choices. Yesterday we were able to cruise the ICW in respect of the winds and currents of the time. We almost had no choice to go only open waters due to the closing of the Boca Grande bridge due to construction. That would have meant dealing with rough open seas which requires its own special considerations. The bridge changed closure dates caused by their own setbacks which gave us the desired option of running the ICW. Our port of call for the evening was the St Charles Yacht Club in Fort Myers. We were heartily welcomed there and enjoyed a scrumptious dinner with some snowbird friends from Pennsylvania/Cape Coral. Grampstr's Pride is on its way to the Miami International Boat Show. 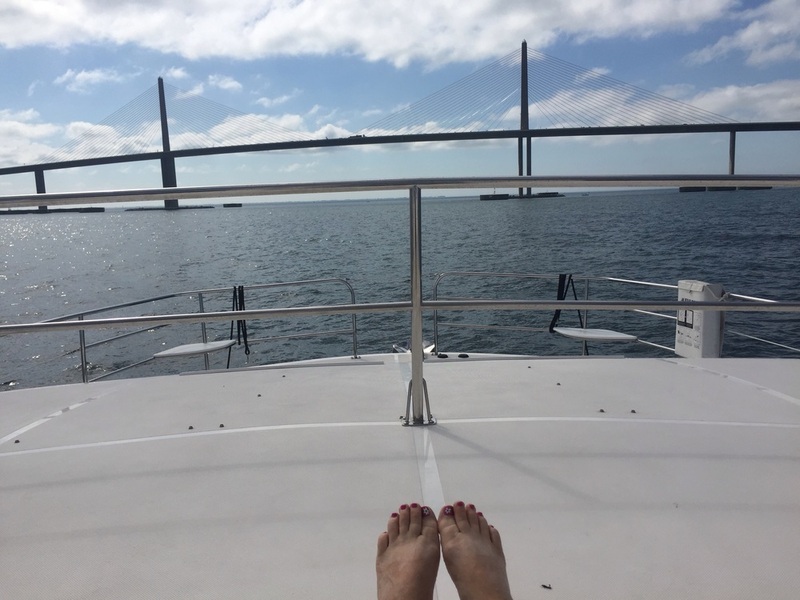 After waiting for the fog to lift it was smooth cruising under the Sunshine Skyway bridge working our way to the Venice Yacht Club. 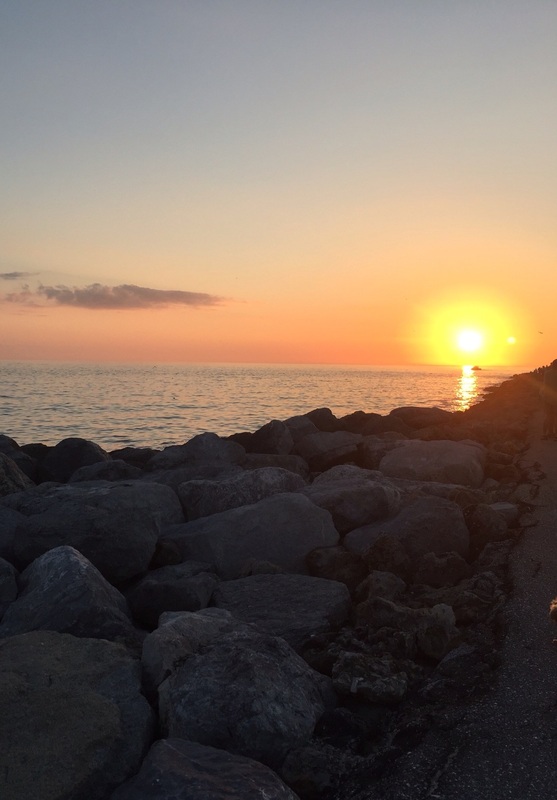 Just in time to witness a glorious sunset at the inlet jetty. What a wonderful way to welcome back the beautiful weather. If your ready for spring break you should consider a charter with us. We have just finished the Sarasota Boat Show at Capt. Jacks Marina. We want to thank everyone who stopped by the Grampstr's Pride while at the show, The Grampstr's Pride is the latest model of Endeavour Catamaran's TrawlerCat 48 one of 3 Endeavour on display at the show! The show was great success! Endeavour signed contracts for a new 48 and 40 and GECCharters received a lot of interest for our newly added charter locations to both Ft. Myers and St Petersburg. Sarasota itself is a great destination to visit because the Ringling Brothers Circus Museum is there and is one of our clients favorite stops when chartering out of St. Petersburg. We are planning a "no rush exploratory cruise to find charter locations for future trips for our charter guests." We will be taking this opportunity before we start our first Grampstr's Pride transition cruise.